Two weeks ago we added integration with Google Mail to easily handle workflows. Today we’re launching two new features for our Google Apps users: integration with Google Docs & Google Calendar! 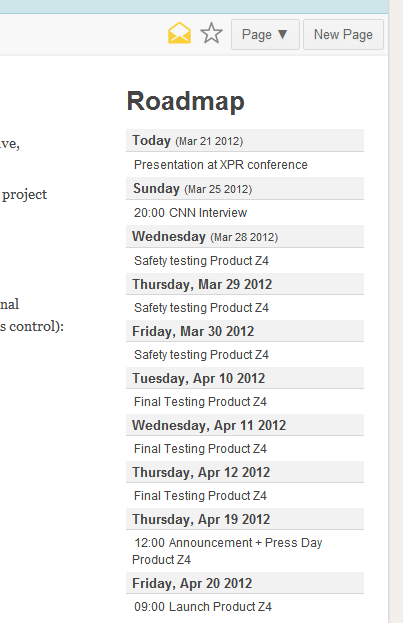 Google Calendar events on a Papyrs Page. You can create as many Google Calendars as you need. You can create Calendars for upcoming milestones, meetings, travel schedule, and so forth. Then you can simply drag a Media Widget on a Papyrs page and pick the Google Calendar of your choosing. People you share the Papyrs page with will then be able to view the events on the calendar. The old Google Calendar widget (which doesn’t work so well) is still available. It’s now called “Classic Calendar Widget”. As many of you know already, you can place your Thymer tasks and deadlines on a Google Calendar using iCal (read more). So the next logical step is to put Thymer deadlines and milestones on a Papyrs page. So now you can. Next to each Thymer calendar event you’ll find a small link directly back to the Thymer task. Pretty handy! Documents, Spreadsheets, and Presentations attached to a Papyrs Page. This makes it easy to create pages to get an overview, organize, and discuss all relevant documents, whether you stored them on your PC, in Google Docs, or already have them on Papyrs. You can take advantage of these features as a Google Apps user or you can attach Google documents from your personal GMail account. Both works, so use whatever suits you best. You can now change the order of attachments with drag and drop. Only a small change, but apparently something quite a few of you wanted! and then click on the Papyrs logo on the bottom of the page. Then, under Data access you’ll see an option to grant access to Papyrs. If you have trouble getting these features to work, just drop us a line at team@stunf.com and we’ll figure out what’s wrong. Also, Google Apps for Business is free for up to 10 users (Google Apps signup). The Papyrs logo (or the Logo of your organization) in the upper left corner of every page is now clickable. It takes you back to your homepage. Image Galleries now work better on mobile devices. 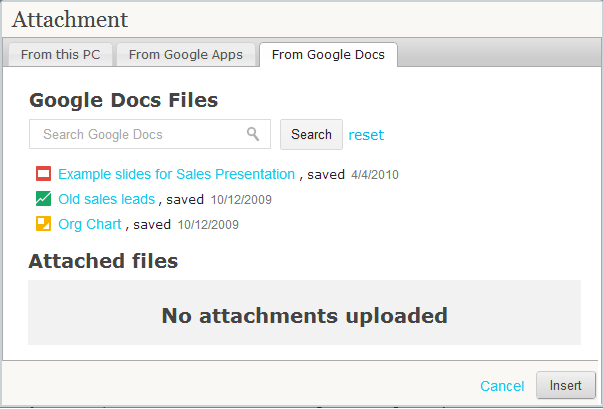 Attachment links are now clickable in the notification emails we send out. We improved the integration of Papyrs with Google Apps by popular demand. So if you’d like to see even more Google Apps integration, let us know. Or maybe you have other ideas for Papyrs. Feature suggestions or perhaps you found a bug. Just shoot us an email. We’ve been working hard on a lot of things we can’t reveal just yet. Some big, some small. More soon! Great update. The Google calendar widget is so much better. Previous PostPrevious Manage your Form Workflows from your Inbox!